Last month I did labels for a series of wines exported to Belarus, brand-named Retro. A couple of weeks ago the client ordered me a new series of wine labels, also for Belorussian export, but with a different brand-name: Salkhino. As in the previous case, I started with the trademark design. I did something in the spirit of the previous project, but with more "geometrical" approach. The logo font is largely based on a Cyrillic version of ITC Anna, although it's been heavily modified to fit the design requirements. 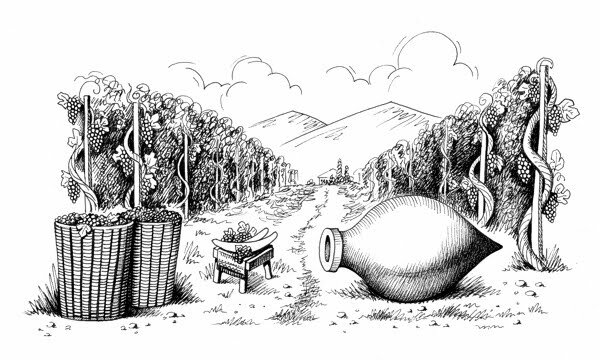 The client wanted different hand-made artworks for each label, so it was high time for unleashing my "Kakhetian fantasies" -- the wine-related drawings I usually do for my wine labels. 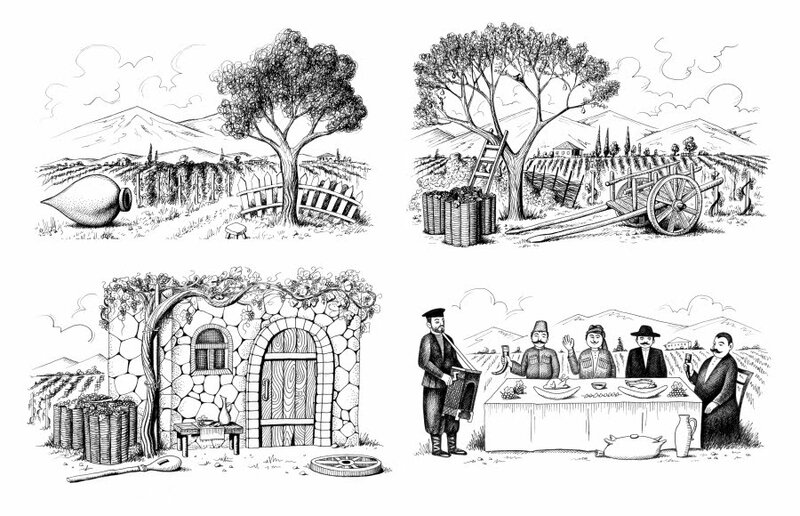 As a result, below you can see some of the drawings made exclusively for this project -- namely, the ones used in the dry wine labels. For the semi-sweet wines the client wanted the same composition, but darker, more saturated colors. Naturally, the artworks also had to be in different style, more suitable for the "heavily colored" settings. Everything went nice and smooth, until it came to the point of the approval from the Belorussian distributor. We had some experience from the previous project concerning the Belorussian bureaucracy in regard to the product design standards, but, apparently, they had more rabbits hidden up their sleeves than we thought. 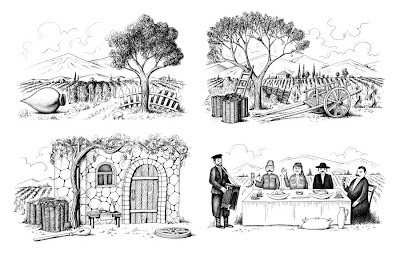 The distributor approved all the labels, except Pirosmani -- a red semi-dry wine named after the famous Georgian painter Niko Pirosmani. The problem was in the drawing I made for it, which depicted a traditional Georgian festive scene in the spirit of the above-mentioned painter. As it turned out, the advertisement law of Belarus explicitly prohibits featuring any images of humans or animals in alcoholic beverage advertisement, as well as displaying the alcoholic beverages themselves and the process of their consuming. When I pointed out that the advertisement restrictions could not be applied to the product design itself, they replied that while the law didn't affect the product design requirements directly, there were numerous supplementary decrees, resolutions, state standards, and so on, which they had to comply with, so they didn't want any complications. There was nothing we could do, so I had to replace the drawing with a different one, similar to the other labels, but with no Pirosmani-related motives. (You can see the replacement drawing on the right.) It's a real shame when some irrelevant requirements force designers to put their creativity on a leash in order to comply to the rules.